TMZ posted video of Ginsburg walking through an airport to prove she is alive so she can “work from home” on the Supreme Court this week. 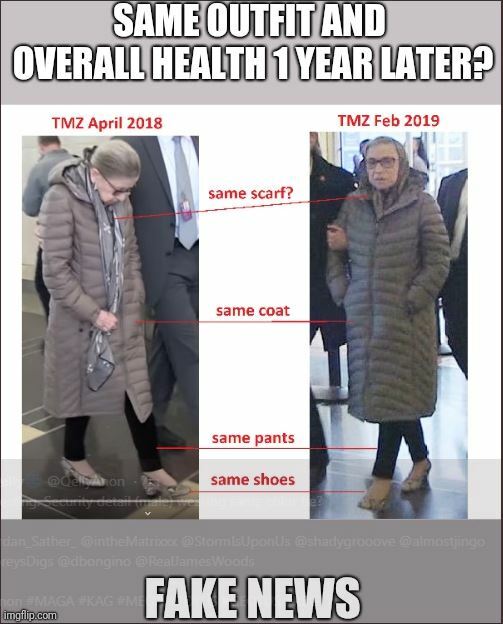 An AIM super sleuth pointed out that Ruth was seen in the same outfit at Reagan LAST YEAR. Seems like a good time to share our Ruthie meme collection, too. This entry was posted in Politics and tagged Ruth Bader Ginsberg on February 19, 2019 by Bone Fish.